Last week I was reminded how precious the people you love are and it prompted me to organise a family trip out on the launch over the weekend. I haven't been out on 'the launch' yet. When it was bought, about four months ago, I had a little snit about it. I mean, I'm living with a longdrop toilet and hubby goes out and buys a launch without telling me! He literally came home and said,"Guess what I bought today, honey?" The running joke has been that he did get me a flushing toilet, he just surrounded it with 36 foot of boat! Anyway, I can't really sulk over it because it was bought by his co-owned business for promotional and testing purposes. So we spent Saturday cruising the Bay. We did a spot of fishing, but weak stomached that I am, I was soon requesting a beach stop. 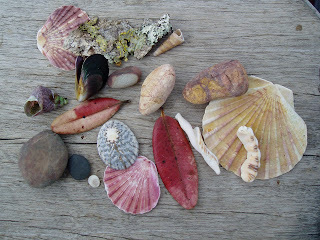 The kids loved exploring the rocks and 'caves', paddling in the water and collecting treasures. 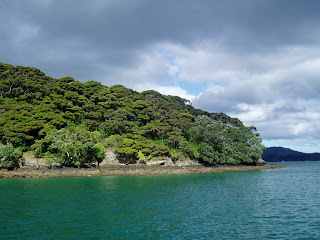 We anchored for the night in a little sheltered bay and had a barbecued dinner. 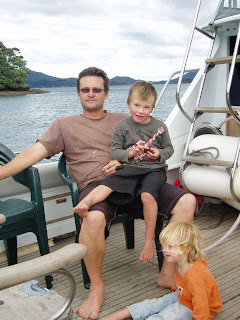 The kids played on the boat like it was a jungle gym and eventually settled to sleep in the forward cabin. I can't say the bunks are the most comfortable but ok for one night. Hubby wants to re-cover and re-foam the squabs (can I have my flushing toilet first?). The next day we had scallop sandwiches for lunch. 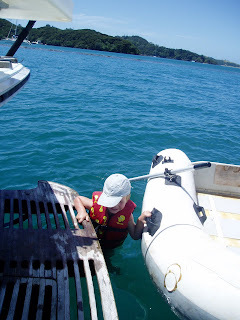 Mister 5 gained loads of confidence swimming off the back of the boat. Even I had a bit of a swim. Eventually we began the trip home, with two tired and happy children. 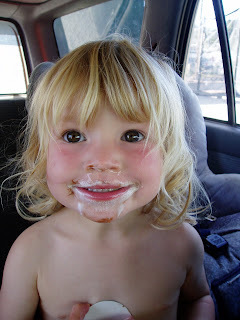 And of course, the obligatory ice cream on the drive home. About the one and only time she wore it and yes, it's been ironed since then! Well, the little giveaway that I did comes to an end today (I almost forgot!). And Kez from Kez's Creations got pulled out of the hat. Good odds, though, there were only two comments! 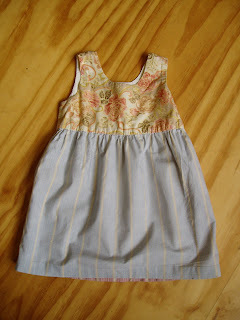 But I'm glad this little dress will be winging it's way to someone who wants it. This is making me intensely happy at the moment. I've longed for a proper space to make a vegetable garden in, and now I have one AND it's growing well. In fact, the photo below is the same space just two months ago. 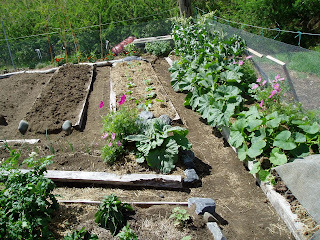 I have potatoes, basil, sweetcorn, rhubarb, courgettes, pumpkins, leeks, carrots, dwarf green bean, sugarsnap peas, capsicums, sunflowers and herbs. I have one bed planted in a compost crop of mustard (amazing how fast that stuff grows!) and I have a big pile of horse manure ageing away to be dug in in autumn. 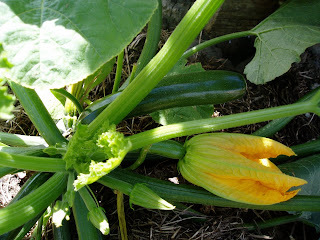 The earthy smell, the joy of watching something grow - why don't people garden more? 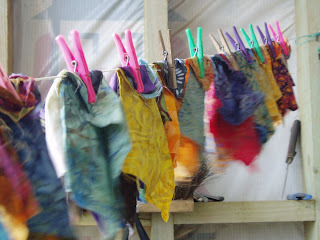 Like little prayer flags flapping in the wind, these batik charm squares look so beautiful dancing on the clothes line. They are destined to become a quilt for my mother in law. And is this not a beautiful work in progress? You can see the progression of developing courgettes in a spiral, from almost-picking size right down to little-green-nub size. From two plants, we are picking one or two a day, just perfect for our little family of four. Ever since we came back from our holiday I've been fighting a little war. They have been sneakily breeding and now in the warmth of summer, with plenty of grass seed heads around, there is a population explosion. I can hear them. I can SMELL them. And the last straw? Is when I can SEE them. 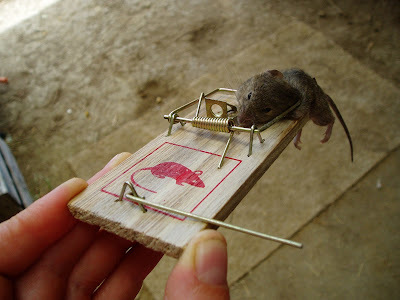 When I see a mouse in my house, out come the traps. But they are crafty. They are light footed. And this little one had been gorging himself on peanut butter and cheese for nights now, WITHOUT setting off my trap. 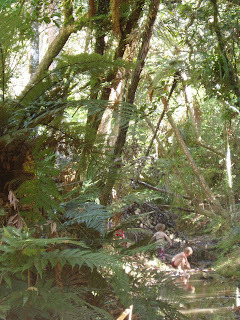 Spending hot afternoons in our cool bush gulley with various family members who've been visiting. Admiring my nine fluffy yellow ducklings. And laughing at how they ALL want to swim in the old frying pan filled with water at once. Worrying about Griselda's growing lump. It looks yucky, but she seems happy. My brother (who happens to be a HUMAN doctor) thinks it might be a basal cell carcinoma. I guess we'll just continue to give her a happy life - and I might look around for a vet who knows something about chooks. Being teased by the weather Gods. Looks threatening, but do you think it'll rain properly? Nope. A drizzle here, a few drops there, then I know my hopes will be dashed again. 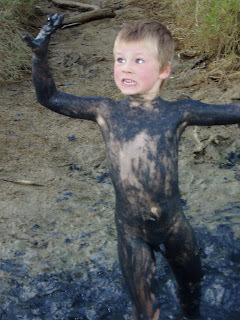 Oh well, I'll just go cool off in the bush again. I am doing my very first blog giveaway. It's motivated by purely selfish reasons - I want to see this go to a good home, and currently I don't know any little girls that would fit this. 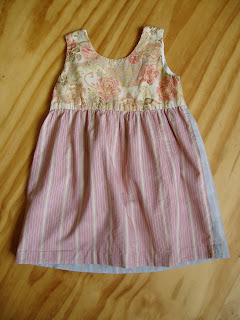 It's pure cotton and has a lined bodice. You can wear it with either the pink or blue skirt forward, it slips over the head easily. And as for sizing, well I have to guesstimate. It is just getting a little small for Olivia now and she is two and a bit and she is average to small. So this is open to anyone, anywhere. If you want to pass this post on to someone who you think might like it, go ahead. Just leave me a comment and I'll get said daughter to pull a number out of a hat on January the 25th then I'll contact you via your blog (or leave me an email address) to post it to you. Edit: Thanks Cathie (aka M.E)! It works and now my post is in the right place. I am learning new things about blogging all the time. Here's a new one I learnt today: If you don't publish a post straight away, and go and edit and publish it later, it will publish to your blog under the date you started writing it. I started writing a post of the 15th of December about a blog giveaway, and then I decided that it was a bad time to do it as I was about to go holidaying. So yesterday I published it and today I went and checked my blog and it wasn't there! I found it, of course, on the 15th December. I presume I could have changed the date to publish yesterday - but that will be next time's step to learn. I certainly can't see anyway to change it now. So, IF you are interested in a giveaway, and IF you can be bothered to look back to December 15th, then go have a lookie. And IF anyone knows how to move a blog post date once you've published it, feel free to increase my knowledge base! I was working on this yesterday (wednesday) so it fits in the catergory of WIP Wednesday even it is officially Thursday. I my bid to be extremely organised this year - an idea borrowed from my sister (such a great idea, I wonder why I didn't think of it?!) - I'm going to do lots of little projects so I can just dip into them when I need a gift for someone. This project will be a set of reusable grocery bags. 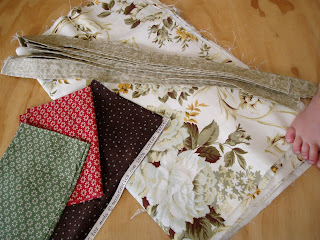 Thrifted fabric, probably old curtains, with some of my cottons from my stash. The orangey red and green were bought by my sister in law in Japan, so they've travelled a fair way. Are they cute or what? There are definitely three now and perhaps more under Mama Black Hen. William got the first hold (I managed to sneak one away while MBH was distracted!). He wasn't that pleased to learn that they are destined for the table, so maybe I will keep a few hens (I know drake is the name of a boy duck, but hen doesn't quite sound right for the girls, anyone know?) to breed from. That little slice of yellow fluff is a duckling! 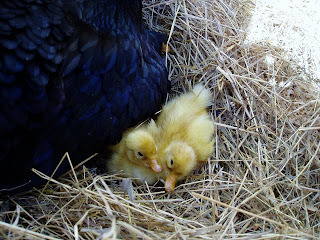 Today is the day they were due to hatch so I opened up Mama Black Hen's box and .... ta da!! 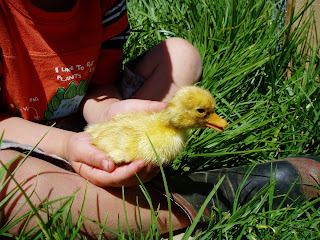 I have at least one little yellow pekin duck. But Mama Black Hen is grumpy. I would be too after sitting there for more than a month (duck eggs take 28 days instead of 21 for hen eggs). She growled at me and fluffed herself up all protective like. I don't like hen pecks so I left her be. I wonder what she'll think when her offspring jumps in the water dish? I swear it really is a duckling. See the little orange foot? Lets hope for more than one! Now, "Sweetie? About that duck pen. It's getting just a little more urgent!" Family Photo Time - say cheese! 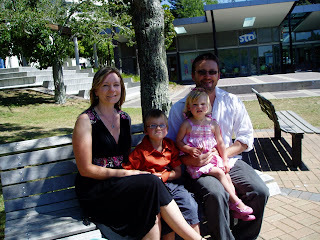 We spent the weekend in Hamilton at DH's cousin's wedding. And I decided that we needed a family photo. We don't have too many of them. Usually I'm behind the lens so you don't see me, and getting everyone to sit still and smile for the camera is hard work. 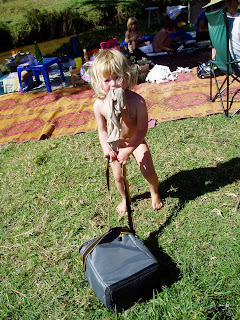 But seeing as we were all wearing clean clothes for once, I decided to enlist the help of an Aunty and give it a go. "Come on, behave for Mummy. Turn around and look at the camera!" "Now if you don't smile, there won't be any pudding." "Oh, well. I guess it's better than nothing...!" A little while ago I found myself reading backwards through my blog like a diary - interesting to see what we've been up to and what we've achieved over the past few months since I started writing. And now it's that time of year when we typically feel the need to redirect ourselves, make sweeping resolutions about our waistlines and exercise regimes, how we are going to achieve straight A grades, become the CEO of the company etc, etc. So here I am, thinking about this next year in the progression of my life. What do I want from it? What will it demand of me? 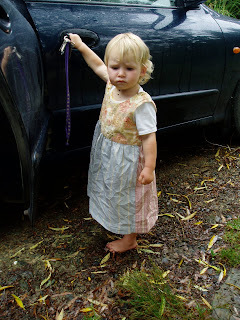 Working as an Independent Midwife, perhaps homebirths only, along with some consultations as a herbalist. 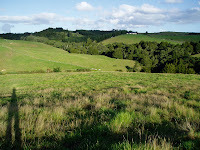 Be living in a house with 5-10 acres of land that I own jointly with M.
Have an earning rental property. 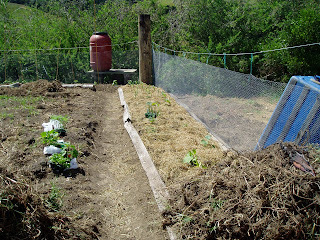 Have a large herbal and vege garden, an orchard and chooks. Have a couple of children. So eight years later, it's that time of year for an evaluation. I have not completed my Herbalism studies! I started and almost finished the first year by correspondence and then had to cut it short when my first child arrived. It is still something I am interested in. 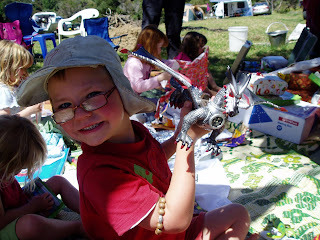 Now that the children are a little older, perhaps it is something I could look into again? I have worked for a few years as an Independent Midwife and worked out the best way to fit it into and around life. But for now I have given up (paid!) work completely. We found the right bit of land and we are finally living on it! We do have an earning rental property. Although I personally don't own it, I do benefit from the income. And it's fully renovated, which took a long time in coming. As for the garden etc. I have started establishing one this last year and the chooks have been around for a while. I have my eyes on an orchard next. And the kids....well, they arrived earlier than planned, but they say the best gifts are surprises! So in 2007 I wrote another 10-15 year plan. Living out on our land, house finished, garden giving us most fruit and veges, chooks, cows and ?pig, herbal garden. Happy in whatever part-time employment I'm doing, ?midwifery. 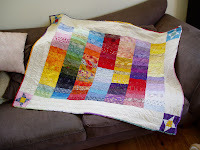 Have enough time to quilt as I wish. Freehold with savings and investment property. Not too much has changed. 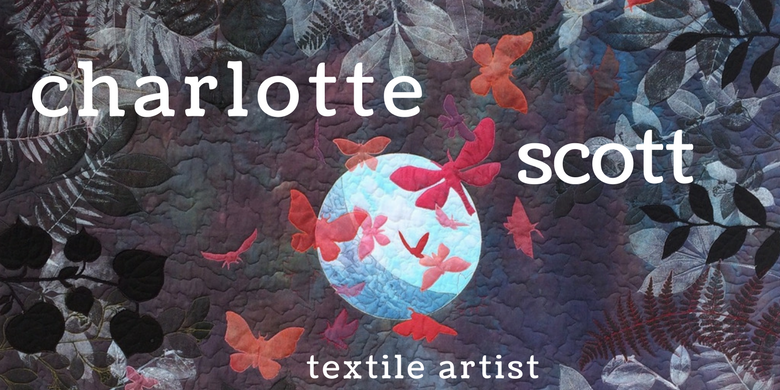 Quilting made an appearance after I discovered the joy of creating! And I guess I'm refining the type of lifestyle I want to lead. Really, if I wrote another 10-15 year plan today, I wouldn't alter much from the 2007 one. 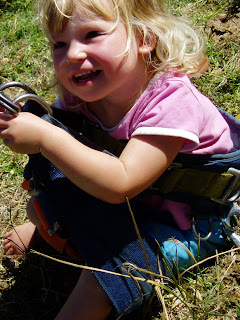 The nitty gritty then: what are my plans for this year? What specific goals do I want to achieve this year to help me live the life I want for my family and I? ORCHARD. This is my big one for this year. I want to plan, prepare and plant an orchard. And it's the planning and preparing bit that I really want to do properly. RABBITS. I've been interested in rabbits for meat for a little while. 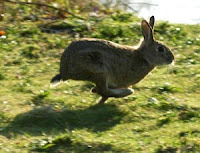 Then I found some more information on it and it has really motivated me to try and incorporate rabbits into my growing systems out here. By the end of the year, I want to be eating my own bunnies (apologies to all who find this idea a little hard but this is what sustainable agriculture is all about). LAND AND HOUSE. We own our block of land as tenants-in-common with another woman. We always had the intention of formalising a subdivision into two titles and this year we want to have some concrete progress towards that goal. Also we will shortly be constructing another shed and a large veranda on the front of this shed, so to have that completed and functional this year will be great. WATER SUPPLY. We are officially in a drought. In this area we haven't had any significant rain for about three months. One rainwater tank is not cutting the mustard. So this year we need to investigate our options and establish a more consistent water supply in case we have the same weather pattern next summer. HAPPINESS. 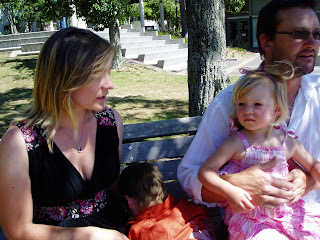 And then a not-so-concrete, but probably most important goal: To make our family situation what we envisaged it when I made the decision to give up work. That is to have the kids in a routine, have time together as a family and time to spend doing the things we enjoy, and for me to have the time to provide my family with wholesome, homegrown and homecooked food. 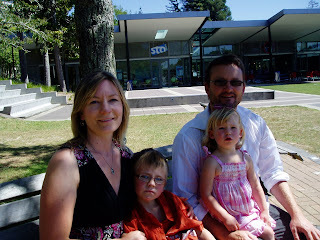 Yesterday we arrived back from our two-week camping holiday. We are tanned, happy and rejuvanated and absolutely exhausted! Now I'm surrounded in the chaos of unpacking, mountains of washing, lots of work to catch up on around home, and barely any water in our tank. It's good to be back. Here are a few photos from our trip. 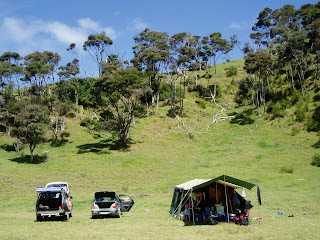 We camped in the middle of a paddock. 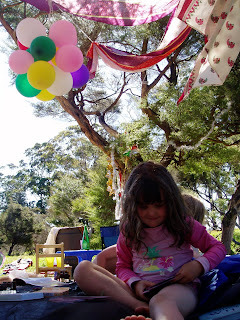 We had a chaotic, communal Christmas day under manuka trees. Some of us nicked off with our Daddy's christmas presents. 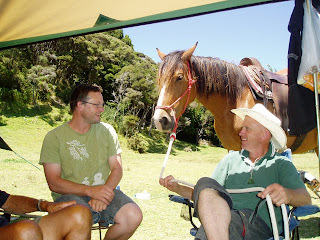 Our lunch guests sometimes had hooves and saddles. 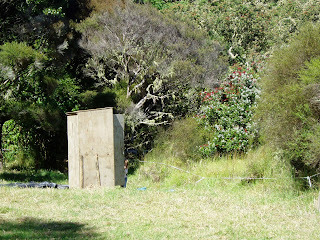 Our bathroom arrangements were picturesque (if a little primitive). 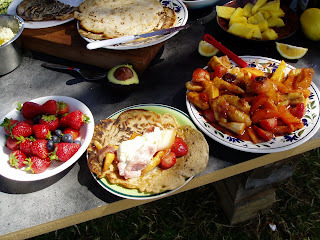 We ate extremely well (too well, my waistline will testify). 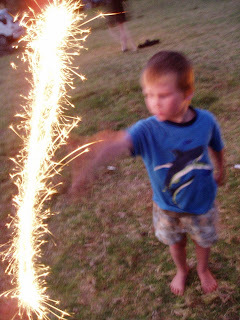 New Year's Eve was a sparkling affair. And we took great care of our skin.